Purple is one of my favorite colors to wear. I think it really commands attention in a room, and I believe it is known as a "power" color. Not that I like to command attention in a room. I'm more or less the girl in the corner, happily reveling in my wallflower status. But purple is beautiful, and especially the really rich, saturated kind. This ruffly top from target is more of a magenta/plum hue (although in this lighting, it leans more pink than it truly is). Hey, it's still purple to me. Paired with a complimentary blue beaded necklace and Butter London's ode to Prince William's love, and I was ready for a night out with the girls. This purple color is striking on you! Love everything about this outfit! That hue is amazing on you! I like it with the bright blue jeans. You look fabulous, girl! This color looks so great on you! The color is SO pretty, it looks fantastic on you. I have a small obsession with this top! Super cute on you! Thank you so much girls :) The top is by Mossimo and comes in four different colors I believe. It's called the Mossimo women's sleeveless top with looped ruffles. Mouth full! Purple looks great on you!! You look GORGEOUS! I love this purple shade on you; it's absolutely phenomenal. 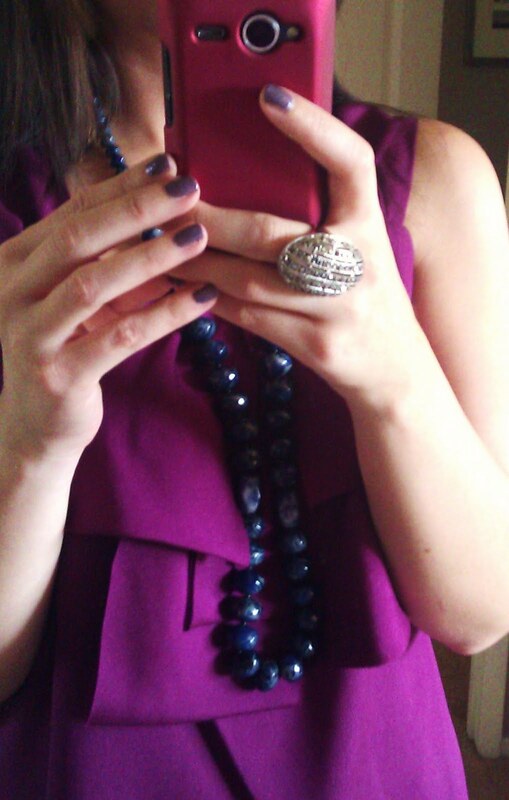 Purple is a royal color. So gorgeous. I love this whole outfit!